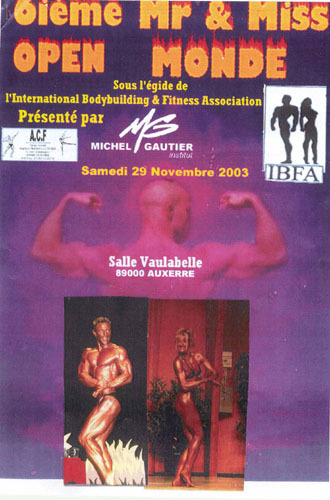 Michel Gauthier president of IBFA France, is proud to welcome bodybuilders from every nation to compete in Auxerre (150 km from Paris), for sixth edition of the Mr. e Miss World open IBFA. For each delegation, we offer two nights spent in a double hotel room, breakfeast included, for 6 athlete and 2 officials per delegation. Hotel Sainte Nitasse Ruote de Chablis 89000 Auxerre= 15 euros per person in double room). Free trasportation from Orly Paris airport to Auxerre and return.